App stores have thrived beyond all expectation in the consumer space over the last several years (as a primary example, Apple shipped its ten billionth app earlier this year through its market-leading, though proprietary, App Store.) A current rush to adapt this successful new distribution model for software to the enterprise has met a decidedly muted reception, at least from those in IT. It’s not that app stores aren’t a good idea in themselves. Far from it. They can provide an enormously useful centralized directory of available software that is matched with community ratings and feedback to sort through the best possibilities while simultaneously making it very easy to acquire the latest updates. App stores also increase the trust level in new applications — and by association their vendors — since many app stores vet their submissions and ensure they meet various criteria for safety. Developers like them because app stores make it easy to rapidly tap into a potentially large (depending on the app store) and ready-made audience while also providing various ready-made methods for monetization including purchase fees, advertising, and in-app purchases. But it’s also this enormously wide variety of choice combined with a very low barrier to access that gives enterprises pause. While app stores have come and gone in various forms over the years, it’s their runaway success on mobile devices, most notable iOS and Android, that have validated the model and more importantly, created critical mass and expectations in the minds of hundreds of millions of consumers as to the richness, variety, and ease-of-use they should expect when they decide to select and buy a new piece of software. Especially in the last year, app stores have now moved well beyond the mobile space. With the opening of Apple’s Mac app store earlier this year, a similar one rumored to be coming soon from Microsoft for Windows 8, and Google having entered the space last year with its Apps Marketplace, along with many other smaller players it’s safe to say that traditional software has begun moving towards the app store model. However, while enterprise app stores have now been launched in earnest from a wide variety of companies, large and niche both, their uptake has been very little like the gold rush mentality of consumer app stores. It may be because the enterprise offerings haven’t hit on the right combination of features, target audience, and application inventory. Or it may be that there is little demand for targeted, just-in-time business software in enterprise settings. I personally greatly doubt the latter, but the former is always possible. After all, it took Apple and both its renowned user experience capabilities and market leadership position to hit upon the right formula and prove that app stores are not only viable but an increasingly preeminent way in which software is acquired. Related: App stores, the new ‘must have’ digital business model. 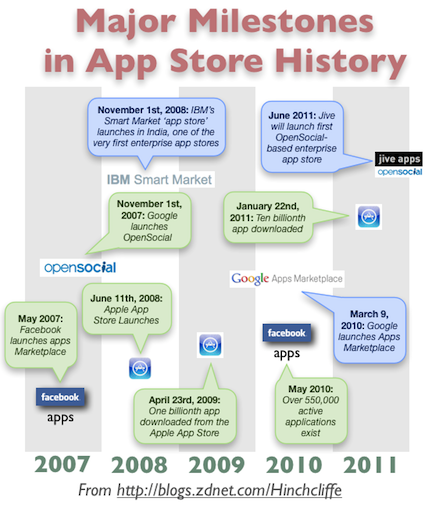 Where’s the market for enterprise app stores? I’ve been watching the enterprise app store space since its inception and it’s clear that IT departments are not exactly lining up to enable this new software distribution channel within their organization as a faster, more hassle free conduit for access to a wider variety of price competitive business solutions. In fact, IBM’s own offering in the space,Smart Market, has seemingly come to this same conclusion and proceeded directly to the most under served business segment that’s much less likely to have the bureaucratic and cultural hurdles that larger organization will have. This market is small and medium sized businesses (SMBs) and they don’t have IT departments or very much time and expertise to invest in independent vendor comparisons, complex installations, or painful recurring maintenance. SMBs want utility software that’s 1) easy to find with 2) plenty of selection so they don’t have to customize it for their needs, and 3) with lots of competition to drive down price. Incidentally, this is the same market that many SaaSproducts are going after, but never got critical mass around, partially I suspect because they didn’t have a discovery and consumption platform as simple and easy to use as app stores. No, a big part of the issue here is that IT departments are directly in the critical path of enterprise software consumption. Last year I explored how the stranglehold that IT has on both the strategic and tactical use of technology in large companies is slipping for a confluence of reasons. The ongoing consumerization of the enterprise (CoIT) is rapidly leading to something some observers are calling the Personal Enterprise, where users are increasingly in control of shaping their technology experience at work. When the business can’t (or won’t) provide the IT solutions they need, workers can increasingly reach for their personal smart device where they have ready access to software that is often a great deal superior to what they can get at work. That the cost of these new solutions is nearly free, while the outdated enterprise versions are enormously expensively is increasingly lost on fewer and fewer of us. In a microcosm of this whole narrative — and one of more direct interest to those that follow this blog — are enterprise social networking platforms that are now opening up and allowing 3rd party social applications to live and operate in the same way that Facebook apps do online today. Enter Google’s OpenSocial social networking application format, which is getting increasingly popular with business users and especially popular with enterprise social software vendors. The good news is that most of the top Enterprise 2.0 products, with the notable exception of Microsoft SharePoint, now allow OpenSocial applications to be installed and used with them. This includes Lotus Connections, Jive, SocialText, Confluence, etc. The problem with this? There really isn’t an enterprise-ready OpenSocial app store that exists today that has necessary features we’d want to see to provide ready, end-user access to a river of 3rd party social applications. This includes vendor verification, curation, review, payments, etc. And that doesn’t include the kind of feature that IT departments are going to want in app store if they’re even going to set them lose, which I’ll get to in a minute. Interestingly, the default mode of the Jive Apps Market is opt-in, meaning that users within an enterprise can see and potentially install all new apps that are being released into the app market from 3rd party vendors. While it can be changed to opt-in mode, where IT can specify only which apps can be seen, it’s an intriguing test in my opinion to see if enterprises are ready to open up and let their users get better access to the software they need to get their jobs done. Given that about a third of all IT these days is so-called “shadow IT”, meaning technology solutions that are unsanctioned by IT, and you can see why there might be a middle road: Offering a wider selection of apps to users without completely relinquishing control. Bordoli also had good things to say about OpenSocial itself as a model for social applications, saying the use of OpenSocial has “been fantastic. The cost of integration of 3rd party applications to closed enterprise platforms before OpenSocial has been too high. OpenSocial has slashed it to a few weeks from many months.” There’s often been debate on how effective OpenSocial in the consumer space has been given that Facebook has dominated social networking applications on the Internet. But in the enterprise, OpenSocial increasingly seems to be gaining a foothold as a natural integration models that also incorporates the social context of its users. Frankly, while I’ve been bullish on OpenSocial for both internal and external uses for quite a while, there is often a terrible lack of imagination when using it to integrate applications into the social architecture of software. Too often OpenSocial is just used it as a dumb wrapper instead of a way to put social computing naturally into the flow of work taking place in systems of record. I’m hoping we’ll see better from the products that are launched in the Jive Apps Market and other social app stores. Finally to wrap up, I still believe that many of the issues that IT departments — too many of which are either ignoring the broader consumerization trend or are merely being dragged incrementally into doing more instead of being proactive — are failing to be addressed. Admittedly, they are somewhat challenging issues that will require a leader with industry stature. But not solving the issues with enterprise app stores ends up creating an unsustainable situation in the enterprise as users adopt the tools they prefer, but completely on their own platforms under their own control, instead of in a place that both the needs of the business and IT can both live with. Data storage transparency. Businesses, especially large enterprises, are terrified of where their data might end up if it’s not controlled, or at least well-documented and audited. Apps in an app store must at least provide a description of where the data is contains is held and how it is secured, including how often it’s backed up and what the restoration policies are, preferably in a declarative format that can be checked with policy tools. Bonus points for letting companies provide their own backing stores. Additional bonus points for providing on-demand data export of everything within the app into an open standard format. Policy-based opt-ins and opt-outs. Don’t make IT admins have to check each and every app to see if it complies with IT standards. Not having this is what will prevent the flow of apps from reaching users in a timely fashion, it will also protect IT by automatically alerting in the case of the regression of apps that change policy. Striking the balance between policy richness and complexity will be one major key to success.